Adam Sandler (born September 9, 1966), in Brooklyn, New York, to Judy and Stanley Sandler. At 17, he took his first step towards becoming a stand-up comedian when he spontaneously took the stage at a Boston comedy club. He found he was a natural comic. He nurtured his talent while at New York University (graduating with a Bachelor of Fine Arts degree in 1991) by performing regularly in clubs and at universities. During his freshman year, he snagged a recurring role as the Huxtable family's friend Smitty on The Cosby Show (1984). While working at a comedy club in L.A., he was "discovered" by 'Dennis Miller', who recommended him to Saturday Night Live (1975) producer 'Lorne Michaels' and told him that Sandler had a big talent. This led to his being cast in the show in 1990, which he also wrote for in addition to performing. After Saturday Night Live (1975), Sandler went on to the movies, starring in such hit comedies as Airheads (1994), Happy Gilmore (1996), Billy Madison (1995) and Big Daddy (1999). He has also starred in Mr. Deeds (2002) alongside 'Winona Ryder'; Eight Crazy Nights (2002), an animated movie about the Jewish festival of Chanukah; and Punch-Drunk Love (2002). He also writes and produces many of his own films and has composed songs for several of them, including The Wedding Singer (1998). 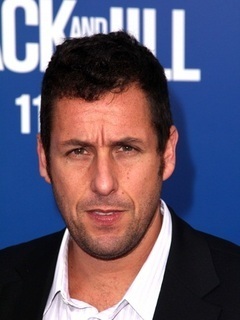 Sandler has had several of his songs placed on the "Billboard" charts, including the classic "The Chanukah Song". In 1988, he was hired as a repertory player for MTV's TV-trivia game show _"Remote Control" (1987)_ (qv). Is a major Yankee fan, refers to the team in some of his films, especially _Anger Management (2003)_ (qv). He has gone to games when the Yankees are playing. His production company, Happy Madison, is named after two of his films, _Happy Gilmore (1996)_ (qv) and _Billy Madison (1995)_ (qv). Dated actress 'Alicia Silverstone' (qv). Former roommate of Writer/Director/Producer 'Judd Apatow' (qv) during his time on _"Saturday Night Live" (1975)_ (qv). Has worked with director 'Frank Coraci' (qv) three times: _The Wedding Singer (1998)_ (qv), _The Waterboy (1998)_ (qv), and _Click (2006/I)_ (qv). Performed at the RNC (Republican National Committee) convention in 2004. Owns a white and tan English bulldog named Motzaball.